Cedardale offers several camp options for juniors during the summer. We have our traditional day camp known as Cedarland Fitness 'n Fun Summer Camp now in its 28th year as well as tennis camps. Please continue to read to get an overview of our summer camp offerings. Register by March 31st and get 5% Off! 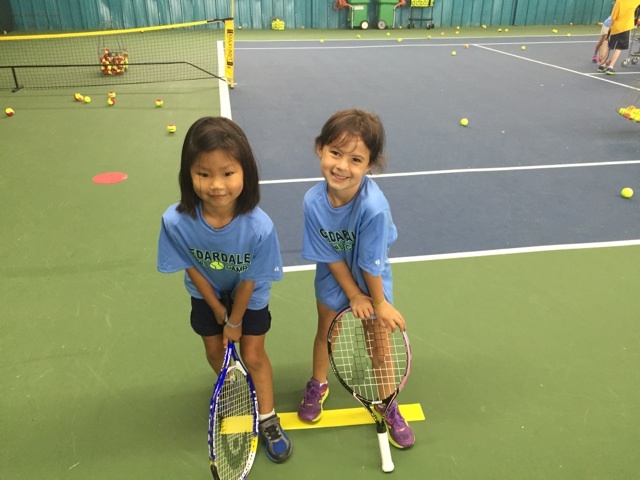 Junior Tennis Camp at Cedardale Haverhill - 2019! Junior Basketball Camp at Cedardale Haverhill - 2019! Players will focus on fundamental basketball skills by participating in fun drills and games. Camp will be directed by Jeff Nelson a Bradford resident who is currently an Advanced Scout for the Philadelphia 76ers. Jeff has also been a successful coach at Reading Memorial High for both basketball and baseball. Campers will be divided up into age groups. Camp will be held on the new 2-court regulation size basketball courts. Space is limited so please sign up early! Questions can be directed to Jeff Nelson at 978-314-8586 or by email at nebbs@msn.com.